In the broadest sense, DEBtox is the application DEB theory (see below) to (eco)toxicological problems. Over the years, several things have been called 'DEBtox', and the first one was a piece of software belonging to the booklet 'The analysis of aquatic toxicity data' by Bas Kooijman and Jacques Bedaux in 1996. The principle is however much more general: I like to use the term DEBtox more broadly for all models that are rooted in DEB theory and applied to (eco)toxicology. It is all about mechanistically linking (time-varying) external concentrations of a toxicant to the effects on life-history traits (survival, growth and reproduction) over time. Therefore, DEBtox ranks as a toxicokinetic-toxicodynamic (TKTD) modelling approach, and these methods are used to analyse toxicity data over time, and to predict effects under untested conditions. Check out DEBtox at WikiPedia. What is a TKTD model? 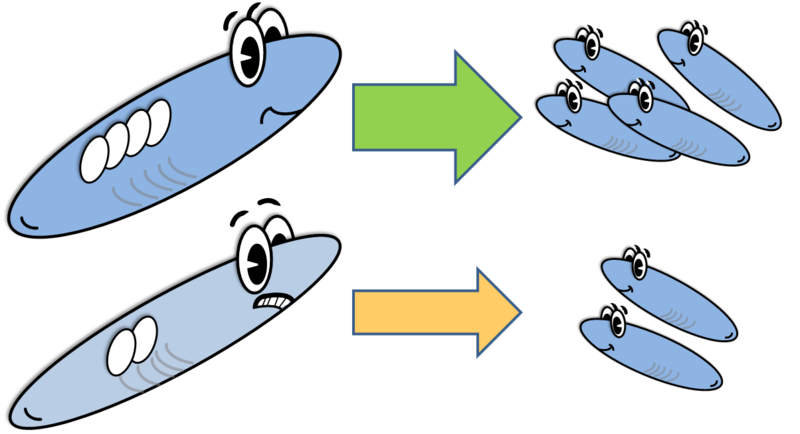 TKTD modelling follows the principle that we need both toxicokinetics and toxicodynamics to make sense of toxicant effects. Toxicokinetics is concerned with the link between external concentrations and internal concentrations in the body of an organism (in human toxicology, this field is termed pharmacokinetics). It thus accounts for processes like uptake, elimination, internal distribition and metabolism of the compound. 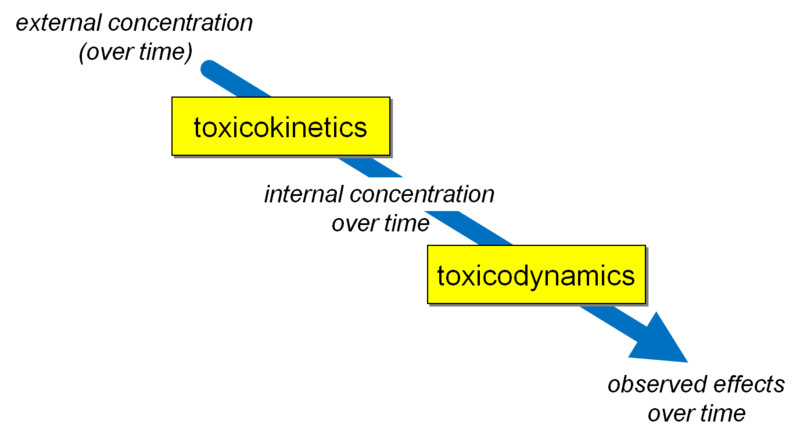 The link between an internal concentration and the time patterns of effects that we are interested in is the realm of toxicodynamics (in human toxicology, pharmacodynamics). Linking TK and TD thus allows to mechanistically link external concentrations to effects over time. 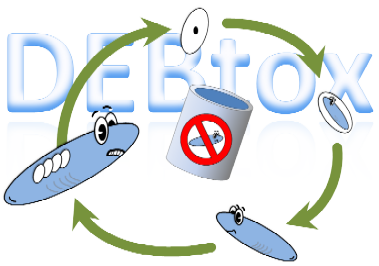 So what makes the DEBtox principle special? The DEBtox principle differes from other TKTD approaches in that the toxicodynamic model is formed by a model based on Dynamic Energy Budget (DEB) theory. 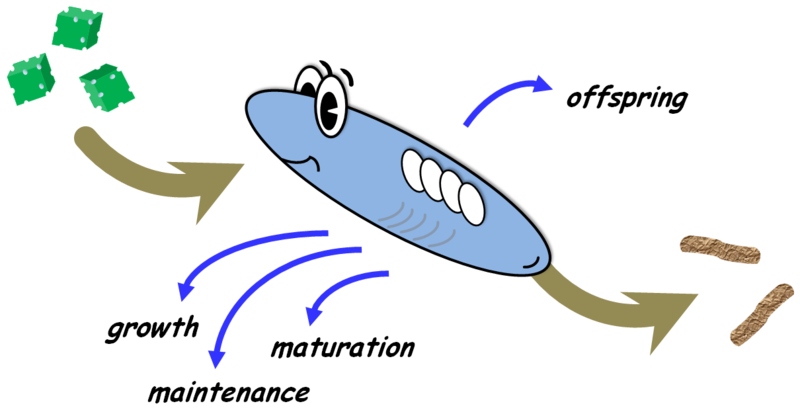 This can be any DEB model: the 'standard animal' model, a simplified animal model such as DEBkiss, an algae model, etc. When the model has its basis in DEB theory, I like to call it a DEBtox model. The toxicant, after being taken up into the body, affects one or more metabolic processes in a DEB model. Examples of such processes include the maintenance costs per unit of structure, the assimilation of energy from food, or the probability to die. DEB stands for Dynamic Energy Budget theory, as developed by Bas Kooijman. In essence, DEB theory consists of a simple set of rules that specifies how organisms acquire energy and building blocks from their environment to fuel their life cycle, from embryo to death. The theory applied to all species on earth (and possibly on other worlds too). This theory is not just useful for ecotoxicology; there are also applications in aquaculture, sewage treatment, and much more. A readable conceptual introduction can be found in my e-book, which can be downloaded for free. This book is math-less; it is all about the background and the concepts (the technicalities are available in a separate book). The focus in the book lies on (invertebrate) animals. A more complete and thorough description of DEB theory is provided in the 2010 book of Bas Kooijman, which is also a much tougher read. This latter book is not free, but friendly priced. A comprehensive review on DEB theory was produced recently by Marko Jusup for Physics of Life Reviews. Check out the "Summary of Concepts" on the books homepage. For an introduction into the theory in the open literature, consult the papers of Kooijman (2001), Nisbet et al. (2000), or Van der Meer (2006). Or check out the DEB portal or DEB at WikiPedia. In this YouTube video, Bas Kooijman introduces DEB theory himself. Why do I need to consider energy budgets? The level of the energy budget is a pretty convenient level to work at. If we see that stressed mothers put out less offspring, that means that less energy is coming out. We thus have to ask ourselves: "where did that energy go to?" Was it never assimilated in the first place (the stress might be on feeding), or is there an additional drain of energy (e.g., to repair damage due to the stress)? Or perhaps, there is less offspring, but they are much heavier. These questions can be quantitatively assessed in an energy-budget framework, without focussing on the biological details of the organism, or details of the stressor. Knowing which energy-based process is affected by the stressor allows us to make predictions for other situations, e.g., when food is in limited supply. Of course, many researchers like to dive into the molecular details of the effect, but end up with something that is very complex, very data intensive, very species- and stressor-specific, and probably of little practical use. Others treat the organism as a black box, and use a descriptive dose-response curve, which is the more classical ecotoxicological approach. For most applications, in my opinion, the level of the energy budget is the best compromise between overly-detailed 'bioinformatics' and practically useless dose-response curves. What is the advantage of DEBtox over descriptive dose-response curves? DEBtox uses all of the available information in its analysis. This includes the effects on all endpoints, for all treatments, and all time points. The result is captured in time-independent parameter values that provide insight into the mechanism of action of the toxicant, and allows for educated extrapolation to untested situations. In contrast, descriptive dose-response analysis leads to summary statistics like the NOEC, EC50, or LC50, which vary between endpoints and depend on the exposure time (a fact that is disguised because exposure time is standardised in the official test protocols). A summary of these problems is given in Jager (2011), and some nice illustrations can be found in Alda Álvarez et al. (2006) and Baas et al. (2010). Because of these issues, such simple summary statistics are poor indicators for toxicity, and anything derived from them (such as SSD's and QSAR's) will be practically useless. Is application of DEBtox really that simple? No, generally it is not. Because you dive deeper into your experimental data, you may discover that crucial information about your test species and/or the chemical is missing. Generally, a DEBtox analysis leads to new questions, but these questions are always more interesting than the original ones! Nice illustrations of the process from data to interpretation (and the associated problems) has been presented as case studies in the e-books and in Jager & Selck (2011). It is always a good idea to think about the data analysis before you set up the experiment, and it is optimal if you can return to the laboratory to address new questions that arise from the DEBtox analysis. What is the regulatory status of DEBtox? The DEBtox method is included in OECD guidance, next to more classical methods that derive NOEC and ECx. This guidance is also available as an ISO guidance. The application of DEBtox, or any other TKTD model, in regulatory risk assessment is still rather uncommon. In any case, the DEBtox method can also be used to calculate an ECx(t) for any x, at each time point t, which could ease the transition from dose-response curves to TKTD modelling. The last few years, TKTD modelling (incl. DEB) is gaining interest in a regulatory perspective, especially in the area of plant-protection products. Specifically, we expect the regulatory application to be facilitated considerably by the 2018 EFSA opinion on TKTD models, which explicitly discusses DEBtox (and GUTS). The EFSA working group judged "that these models are not yet ready for use in aquatic risk assessment for pesticides. Nevertheless, the DEBtox modelling approach is recognised as an important research tool with great potential for future use in prospective ERA for pesticides." Clearly, some more structured research is needed (plus user-friendly software) before routine application will be possible. I hope that this EFSA opinion leads to the urgently-needed funding for that type of work. Are all hazard models DEBtox models? This is a matter of taste. DEB theory applies the hazard concept for survival (i.e., that each individual has a probability to die, which increases with age and stress). Hazard models are thus consistent with DEB theory; when organisms do not grow, age or reproduce, the role of energetics is limited, and the probabilistic aspects may be assumed to dominate. Hence, a full-scale DEBtox model would reduce to a simple hazard model when only survival is considered as an endpoint. However, as there is no energy budget in sight in simple models for acute toxicity, referring to a hazard model as a DEB or DEBtox model is misleading, in my opinion. A more general framework for simple TKTD models for survival is given in the "about GUTS" section. What happened to the DEBtox Windows software? That software is no longer offered or maintained. The underlying equations for sub-lethal endpoints contained a few errors (see Jager & Zimmer, 2012), and it was programmed in such a way that it was very difficult to keep up to date with newer versions of the Windows OS. The Matlab implementations DEBtoxM and the BYOM-package that you can find on this site are much more flexible and up to date, but of course, also less user-friendly. Where can I read more about DEBtox? A thorough conceptual introduction can be found in my e-book, which can also be downloaded for free. This book is all about the background and the concepts. The math is banned to a separate document for the die hards. For a general introduction in the open literature, consult Jager et al. (2006). For most practical applications, the simplified DEB model as presented by Jager & Zimmer (2012) is most useful, but the general approach with a full DEB model was published by Jager et al. (2010). More recently, a simplification with explicit mass balance was presented as 'DEBkiss'. A list of publications on DEB models and toxic effects is collected here. This website of course contains a lot more information about things called DEBtox. I especially would like to draw your attention to the list of publications that I will try to keep up-to-date. Is there a course on DEBtox? In previous years, we had the summercourse DynModTox that focussed on DEB-based modelling with DEBkiss. However, we are currently revising the format of the course (and are in the progress of developing a few new ones), so regularly check the course page for more info.